Current Interruption Transients Calculationis a comprehensive resource for the understanding, calculation and analysis of the transient recovery voltages (TRVs) and related re-ignition or re-striking transients associated with fault current interruption and the switching of inductive and capacitive load currents in circuits. 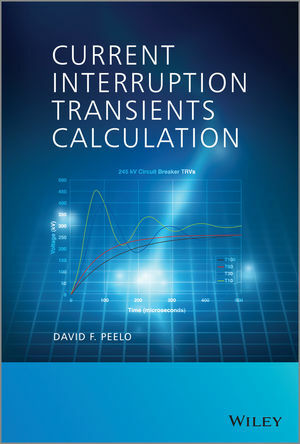 This book provides an original, detailed and practical description of current interruption transients, origins, and the circuits involved, and how they can be calculated and then analysed using only a hand calculator and a spreadsheet program. Detailed theory on all of the current interruption cases that can occur on a power system. Clear explanation on how to calculate transients, showing how four basic circuits can represent all transients and can be solved in general without any use of the ‘classical’ Laplace transform method. Series and parallel RLC circuit theory, followed by the calculation of pole factors using the symmetrical component method to derive the base power frequency components, with results applied to all the relevant transient cases. Fault current interruption and inductive and capacitive load current switching cases illustrated using real application examples. With its practical approach, this book offers engineers the tools they need when analysing circuit breaker applications. It will be of great interest to practicing engineers and electric utility staff involved in circuit breaker design, specification, testing, switchgear application, system operation and planning, and in particular, for engineers using simulation programs for transient calculations. It will also be useful for senior undergraduate and postgraduate electrical power engineering students looking to work in switchgear manufacturers and testing laboratories. David Peelo joined BC Hydro in Vancouver in 1973, first in the Quality Assurance Department, then from 1981 in the Stations Engineering Division as a switchgear and switching specialist. He left BC Hydro in 2001 to become an independent consultant with clients in Australia, Canada, US, India and Korea, teaching advanced courses on surge arrester application, switchgear application and switching in high voltage networks. He has had active leading roles in standards development in IEEE and the International Electrotechnical Commission (IEC). David has authored over 60 technical papers and lead the development of an IEEE guide and IEC standard for shunt reactor switching. He is recipient of the CIGRE Distinguished Member Award and the IEC 1906 Award, and a Fellow of the Institution of Electrical Engineers.